I was really excited to read The Witch Hunter, obviously, because my favorite paranormal creatures are witches. 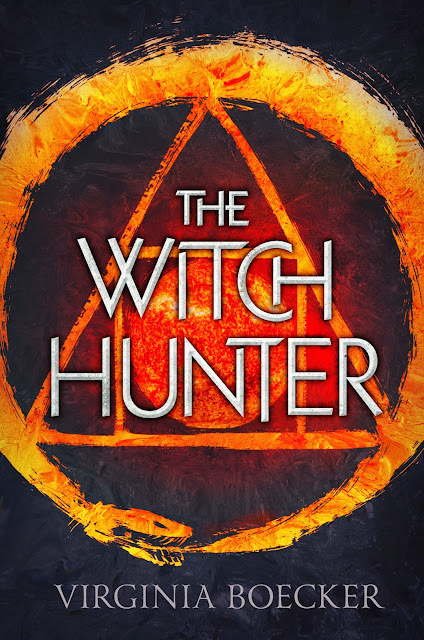 While it didn't exactly wow me, The Witch Hunter was a solid historical and paranormal YA. The beginning is slower than the rest of the story, which may have been why I was a little underwhelmed. Although I did enjoy the beginning, I wasn't sucked in to the point of not being able to put the book down. When I picked it up again, I enjoyed myself, but there was no compulsion that I NEEDED to be reading it at all times. Once the prophecy comes out, the story starts to unfold rapidly, and the last third of the book goes by in a blink of an eye. I loved the prophecy and the riddle behind it, but that's one of my favorite types of fantasy tropes. I was a little unprepared for how fast Elizabeth discovered where the Thirteenth Tablet was located. I'm glad that unraveling the riddle wasn't drawn out, but I do think it caused the last third of the book to be a little rushed. Elizabeth isn't exactly the chosen one, but she is the one that will solve the riddle of where the Thirteenth Tablet is located that must be destroyed to break the curse on Nicholas. I really liked the spin that Elizabeth has to choose of all her actions decisively for the prophecy to work. I also really liked the combination of so many different types of paranormal creatures - there were nymphs and revenants and some interesting lore surrounding revenants. There was one part of The Witch Hunter that was completely obvious. I'm surprised that no one figured it out sooner, especially Elizabeth. I was a little worried that there would be an awful love triangle, and the whole book would be concentrated on the love story rather than the actual witch hunting and riddle solving. However, to me, Caleb is only really an issue at the beginning of the book. I thought that there might be some sort of issue between George and John, but George ends up being a platonic friend. YAY! Platonic male-female friendships in YA! The story arc wraps up nicely with no annoying cliff hanger, but there is the possibility of more to come. I'm interested in seeing more of the world of The Witch Hunter, and I hope that Boecker expands to more countries and more paranormal creatures. To satisfy FTC guidelines, I am disclosing that I received an advance copy of the book for reviewing purposes through NOVL in exchange for an honest review. This has in no way affected the outcome of my review. Wow, I had never actually read a summary for this until now. It sounds awesome! I am not actually a fan of witches in fiction (which is weird since I'm a huge Harry Potter fan) so I just assumed I wouldn't like this one. It sounds like it has a pretty interesting world with plenty of supernatural creatures. And I'm so happy that it doesn't focus on a love triangle. I hope you like it! There is a concentration on magic, but there are other supernatural creatures, too. This is the first I've heard of this one but I'm intrigued. Witches are a favorite of mine and this sounds different, not a lot but enough. If you like witches and alternate histories, you should definitely try it.